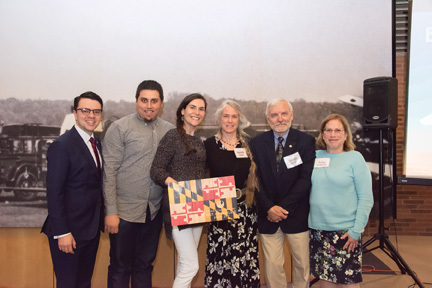 The volunteer Quartermasters responsible for the day-to-day maintenance of the C&O Canal Trust’s Canal Quarters lockhouses have been honored with the Harrison Award for Volunteers at Preservation Maryland’s Best of Maryland Preservation Awards Ceremony. Over 35 volunteer Quartermasters have provided over 15,000 hours of service to the award-winning Canal Quarters program, which wouldn’t be able to operate without volunteer support. The program, a partnership between the C&O Canal Trust and the C&O Canal National Historical Park, rehabilitates historic lockhouses along the canal, furnishes them with period pieces, and makes them available to visitors for overnight stays. There are currently six Canal Quarters lockhouses, with a seventh in progress, and each one is designed to reflect a different time period of canal history. The Quartermasters are the eyes and ears of this program, regularly inspecting the lockhouses, performing needed maintenance, and assisting overnight guests to ensure they have a great experience. Without the Quartermasters’ dedication and hard work, the program would not be successful. We are always looking for dedicated and hardworking individuals to join the Quartermasters team! If you have a passion for preservation and a love of the C&O Canal, consider becoming involved. Visit our volunteer page at https://www.canaltrust.org/programs/canal-quarters/quartermasters/become-quartermaster/ for more information.